The Miami Trace High School Soundsations sang the National Anthem and “May Love and Laughter Your Days” during the Dedication Ceremony. Miami Trace Local Schools held a Dedication Ceremony for the new high school on Sunday afternoon with esteemed guests from Ruscilli Construction, SHP, Ohio Facilities Construction Commission and the community. The Miami Trace High School class presidents each held the scissors as the ribbon was cut. 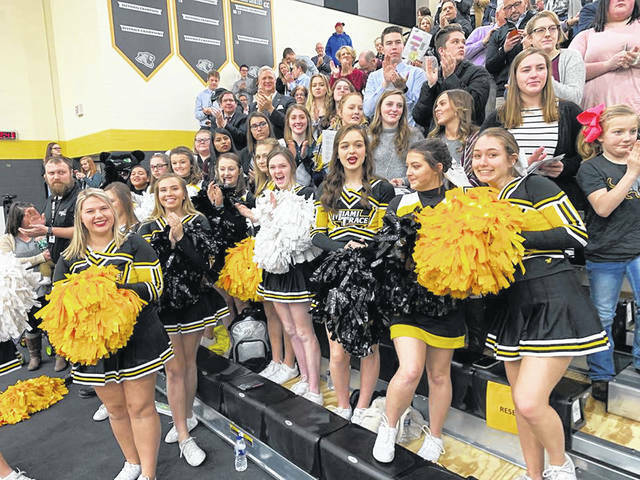 The bleachers on one side of the gym were filled with guests from across the county and state to congratulate the district on its new building. The main office at the new Miami Trace High School. 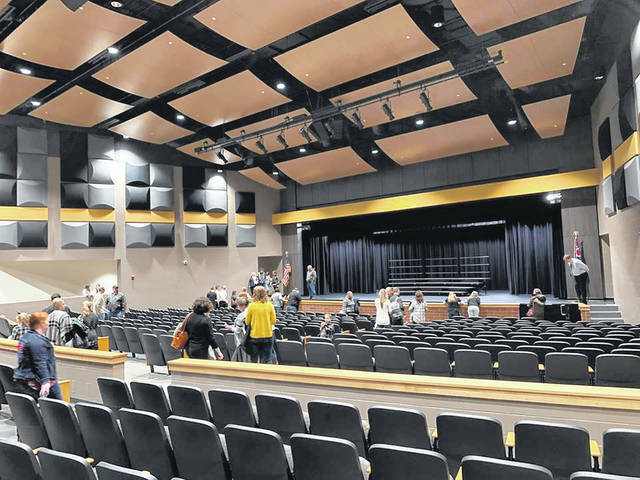 Members of the community checked out the auditorium at the new school during self-guided tours on Sunday. Miami Trace cheerleaders were excited for the dedication of the new high school on Sunday afternoon. 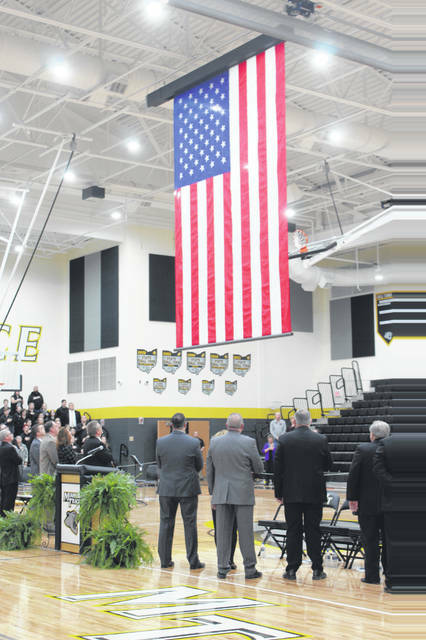 On Sunday afternoon inside of a packed gymnasium in the sparkling, state-of-the-art new high school, the Miami Trace Local School District simultaneously celebrated its rich history and ushered in a bright new era with a dedication ceremony. 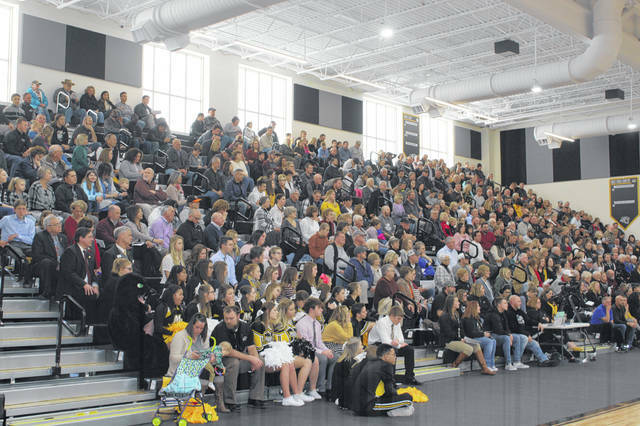 The community was invited to join district officials, staff and students for the dedication and ribbon-cutting, and they came out in droves for the event. Before cutting the ribbon to commemorate the brand-new facility, the district reflected on the journey getting to this point in its history. The new high school, located east of the football stadium, will replace the existing high school that opened in 1962. High school students will move into the building Feb. 20. Miami Trace Superintendent David Lewis welcomed the many in attendance and introduced those joining him on the stage: MT Board of Education members, Charlie Andrews (president), Bruce Kirkpatrick (vice president), Rob Dawson and Dave Miller (board member Mike Henry was unable to attend); administrative team members Kim Pittser, treasurer Debbie Black, business manager Bill Franke, high school principal Rob Enochs, high school assistant principal Bryan Sheets, and secondary curriculum director Katie Abbott; and special guests, pastor Bruce Morrison from Heritage Church, Stacy Thomas, project manager for Ohio Facilities Construction Commission, Josh Predovich, project manager for SHP Leading Design, and Bill Mullett, project manager for Ruscilli Construction Co. Inc.
Lewis also took the opportunity to thank the Miami Trace taxpayers, the campaign committee members, district employees and of course, the students. He added that he cannot wait for the students’ first day in the new high school. Charlie Andrews, school board president and 1966 graduate of Miami Trace High School, said this grand opening was an emotional time for him. 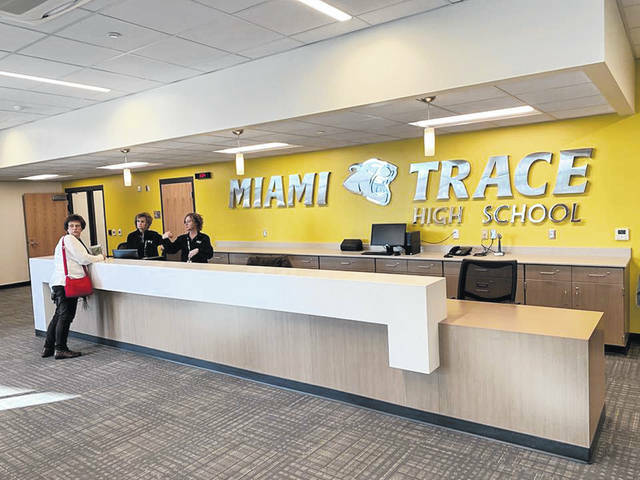 Andrews said the new high school is the culmination of a vision created by Miami Trace employees, students and community members. Josh Predovich, the project manager from SHP Leading Design, spoke about the long and successful relationship between his firm and Miami Trace schools, dating back over 20 years. – The district applied for consideration for state funding to help construct a centralized elementary school. Miami Trace was notified of shared funding approval in the fall of 2004. The community passed the bond issue for the elementary in November 2005, and the building opened for students in August 2008. – Following state approval for shared funding for a new middle school, in August 2008 voters approved a bond issue for the construction of a new middle school, which opened in February 2011. – In November 2009, the district opened a new central office administrative building. – In October 2010, the new transportation facility was opened in order to provide adequate support for the transportation fleet — a fleet which travels a combined total of nearly 5,000 miles each school day. – And now — the new high school: a 162,000 square foot facility designed with a large amount of input from staff and students intended to serve students for the 21st century. “In addition to the community and our staff, this accomplishment has taken the commitment of thousands of people — from architects and construction managers, to steel workers, electricians, plumbers, pavers, painters and roofers. Many of these folks live in our community, and are here today, and should be proud of their contributions to our beautiful school campus,” said Franke. While preparing for the move-in date for students, Franke said there is still more work to do, including: the upcoming contents auction at the old high school, the old high school demolition, and rebuilding the home football stands and related infrastructure. 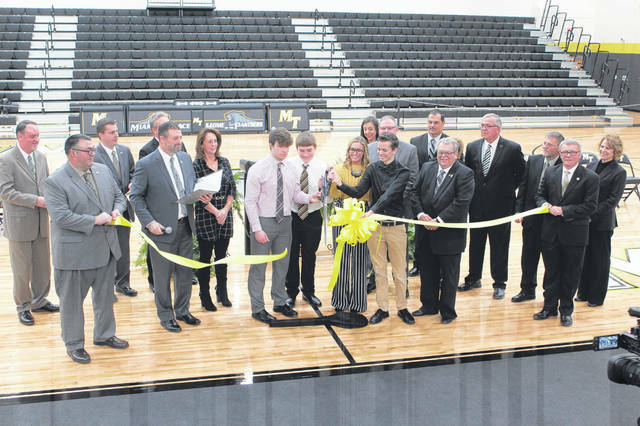 Along with the dignitaries who presented Sunday’s program, class presidents of Miami Trace High School were invited to participate in the ribbon-cutting: senior Tori Evans, junior Cole Enochs, sophomore Sam Braden and freshman Bryce Bennett. The high school Soundsations, jazz band and cheerleaders also entertained during the dedication. Following the event, many community members took self-guided tours of the new school.